Let’s dig into the building blocks of a Rise of the Demon Lord fantasy roleplaying game campaign: the Demon Lord, the cults and the cultists, the bargains, the vague texts, the End Times, and all the good stuff. The Rise of the Demon Lord begins and ends with the lord itself. The cult appears in the beginning of the campaign, hidden behind lies and confusion, spreading chaos and preparing for the lords’ return. The Demon Lord itself appear at the end in the climactic battle for the survival of the world. The Demon Lord can be one of your own designs or one from the published source material of your RPG system of choice. Also, consider the many classifications of demons, and the possibility of fallen angels. Create Your Own Demon Lord Today! You should add lies and twists as a general rule regardless if you use a published demon lord or choose to create one from scratch. Deceptions and twists keep the players guessing, and it makes the game more interesting. Use the following checklist to guide you through the design process. Multiple Names. There are power and protection in obfuscation, and a demon lord seeks to confuse and divide enemies by hiding behind several names. This adds layers to the deception and mystery to your campaign. The same applies to the cult. A cult of Orcus should never call itself the Cult of Orcus. It would be asking for trouble (unless that was the purpose), and make recruitment for difficult. Titles and Proverbs. Demon lords have titles, usually bestowed on themselves or their cult for honor and vanity, or by their enemies. These titles depend on the lord’s intentions. “The Hungry Black Goat of the Void” may scare off enemies and rally allies, while the “Veiled Queen” sounds ambiguous and perhaps even alluring. Likewise, the cults must have compelling names to grow in importance in your story. Mortal Servants. You need to figure out who the cult is and what other servants are at the Demon Lords disposal. The plot deepens and becomes more dangerous if you decide that pick a faction already to fallen to the Demon Lord. Let’s say the Church of Light or the Royal House already has fallen and have been acting on the demon’s behalf for a long time. Your demon cult now has tools perhaps far more dangerous than monsters in the woods or cloaked figures in the sewers, and your story can introduce themes like betrayal and crisis of faith right from the start. History. All demon lords have a history and should be embedded in the setting for increased impact on the story. Map out the demon’s origins, add a couple of conflicts with the setting pantheon, and the lords current status. This can initially be very brief but will snowball as you develop your story and setting, or the characters begin their investigations and ask questions. Weapons. The Demon Lord will have favored weapons, typically powerful artifacts. Make sure you give them proper names so they can grow into legends of their own. For example, the Wand of Orcus and the Ruby Rod of Asmodeus has festered in the minds of D&D gamers for more than forty years now, yet no one cares what it actually does. There is power in names, and you should use that for your world building. Enemies. Likewise, who are the Demon Lord’s enemies? They include rivals demons, archangels, Great Old Ones, titans and slumbering evils of all sorts. They all deserve the same attention as the Demon Lord but also have the potential of stealing attention and diluting the impact of the Demon Lord in your story, so use caution. Here are some of the choices for the world builder regarding demons. The Abyss is often portrayed as an infinite realm of chaos and destruction. Dungeons and Dragons is very specific about what kind of creatures that dwellings there, while the Christian tradition is somewhat looser, with the Abyss seeming synonymous to hell. Abyssal Gates. Abyssal gates are portals between the mortal realm and the Abyss. Many varieties are possible, both temporary and permanent, and some only allow lesser creatures to pass, while others give all beings unlimited travel between the planes. The demons what these gates open, while mortals typically want them closed. The Demon Lord’s Lair. Where is the Demon Lord’s lair, and what is its nature? A bone palace in an ashen wasteland? An obsidian tower in a lush toxic jungle? Do you have any plans for the place? Is the lair intended to be just a mythological place, or do you want a planar metropolis and an end-game dungeon as well? The Abyssal Host is the Demon Lord’s army waiting in the Abyss to march through the gate to destroy the world. The demon soldiers rank from bestial soldiers, demons and minor lords in the service of the Demon Lord. Planar Servants. A lord needs minions, servants, and slaves, just like any other lord. Who are they? The planar servants includes both the demonic host, the Demon Lord’s army, and servants and lieutenants closer to the Demon Lord’s throne. Both are necessary to carry out the lord’s will and subjugate the multiverse. Monster Theme. Creating themed random encounter tables is a great way to define the forces of the Demon Lord. You can use this list to stock any dungeons related to the cult, design ambushes, encounters on the road, and as servants for the villains. Goblins, Orcs, Brigands, Thieves’ Guild, Slavers, Succubus, Erinyes, Fallen Angel, Vulture Demon, Boar Demon, Fire Demon, Cambion, Succubus, Skeleton, Zombie, Undead Knight, Worm-that-Walks, Lich, Ghoul, and Golem. In some worlds, it would make sense to add dark elves, spider demons, and giants. In others vampires and dragons. Your choices say something about your world. You are building a story, a world, and mythology if you can explain why your choices belong to the same list. Once the demons ruled an empire in the mortal realm. It was a dark and terrible empire, but ultimately fell for now forgotten reasons. The empire may even have crossed multiple planes if your game involves planar travel. Are the demons part of the pantheon, and an integral part of your words creation and history? Are the greatest demons equal to gods, or somehow lesser than the gods? The Demon Lord must be more than the top predator on the monster food chain. The various D&D world seems to have settled on Demon Lords (and by extension archers devils and others) being lesser than gods by “promoting” Asmodeus and Garagos into the pantheon. Paizo seems to have adopted the same path with Lamashtu being incorporated into the pantheon. On the other hand, Shadow of the Demon Lord (2015) by Robert J. Schwalb, suggests a different view with the Demon Lord’s presence heralding the Apocalypse, which suggests power equal or greater than the gods. Whatever you decide, your Demon Lord will gain importance and credibility if adequately incorporated into the world history. This means adding previous conflicts with nations and churches, past crusades and devastating losses for the factions to avenge and regrets. No one sets out to worship a demon. Not at first. The demon cult probably does not recognize itself as such. So who are the cultists, and why is there a cult? Initially, the Demon Lord, and later the established cult, needs some excuse to draw in new followers. Some false promise of a better life, restored power, or just recognition. Restore Past Glory. This country used to be great. Prosperous, respected, pure blooded, and powerful, but now it is in shambles. An informal group of powerful landowner and nobles, led by a demagogue, work to restore that past and will accept any help without questioning its source and hidden agendas. Return to the True Faith. The clergy has failed us, fallen to heretical beliefs, and no longer follow the tenents of god. Some, however, follow the true word of god and work to steer the faithful back to the true faith. It may be harsh, brutal even, but is it both just and necessary. After this ordeal, the followers will be rewarded in the afterlife, and the will enjoy a better life in a safer world. Wealth. Join the cult to gain access to new markets and greater wealth. The cult may appear as a guild or trade consortium working to spread prosperity but are in fact built to exploit and destroy others, feeding the relentless gluttony of its masters. Recognition. The cult promises praise and honor, feeding on the insecurity and vanity of its prospects until only empty husks remain of its members remain. Demon cultists come from all parts of society, and even the friendliest face may have beliefs and ideas outside the norm. Who are the cultists? Are they just gangs of crazed serial-killers prowling the streets at night, or have they something more working for them? City Councilors. The demon cults have allies and members in places of power, including the city government. More power is better than some power, and some city councilor cannot resist what appears to be an opportunity to take the final step and rule the city as a tyrant, and the cult provides a way. Nobles. Generations of power, wealth and servants take its toll, and for some noble scions boredom and indulgence leads to darker paths. Who can resist breaking society’s boundaries and explore the full extent of our nature? For others, the lure of even more wealth and power lead to the darkness. Heretics. Sometimes it begins with the unorthodox gospel, free-thinking, and heated theological discussions, leading to questioning beliefs. Hard questions, in some cases. Maybe the church is wrong and needs to reform, changing from the inside. Maybe allies from other parts of society can help and should be contacted. In secret, of course, so no one gets the wrong idea. Templars. The church soldiers sometimes have their own way of doing things, and the clergy must be sheltered from the hard choices that come with war and providing security. Unfortunately, some choices are harder than others, and the templars find themselves serving a new god altogether. The source of magic is key to how summoning and abyssal powers work. The may also work different for different practitioners, depending on their source of power. Power Comes From the Caster. The caster has learned to manipulate magic through either hard work and study, or through inherent ability, and does not rely on anyone else to cast spells. This caster may believe to be stronger than the demonic power, and fall to the demons through pride. Power Comes From a Patron. The caster depends on an outside entity to cast spells, although you may wish this to be a wise and benevolent god, the patron may be something else entirely. These patrons may be fey, spirits, angels – or something darker, like demons, devils and Great Old Ones. Beggars. Society’s poor and downtrodden are favored victims for demon cults. The poor have few options, live in desperate conditions, and most choose to ignore them anyway. Some join cults as a way out, while others join as a way to get revenge on those who put them in squalor in the first place. Hermits. Some choose to live alone, while others, for whatever reason, is cast out of society. Both are favored recruits for the demon cults, as they see society differently and know how to move around unnoticed and sometimes ignored. For some, loneliness makes them easy prey from whispers from the dark. Merchants and Craftsmen. Accumulating wealth is both a skill and a lifestyle, and many seek shortcuts. One such alternative is a bargain with the darkness. Black Marketeer. Some dealers of poisons, forbidden texts, and dark relics take their business one step further. The cults seem to offer great rewards, and the marketeers just get a small cut, so for some, the lure of power and wealth gnaw away any remaining resistance. Raiders. The thieves and slayers hiding in the wilds need magic to find prey, avoid detection and heal any wounded, and no right-thinking healers or clerics would willingly join them. Thus the raiders are willing to accept unorthodox costs and recruits any reliable cleric offering services. Soon the raiders find themselves serving a new master. Slavers. Those who abduct and sell people are already demons in their own right, so joining a cult for more power and what appears to be more comfortable living seems trivial. Thieves. Taking things that belong to others is sometimes the first step, and a slippery slope follows. Convenience, greed, indulgence, the thrill of being “bad,” rebellion, and finally a bargain with darkness to ramp everything up and make things easier. The thief is now a cultist, and may not even have realized it. Thugs. Some folks are good at fighting, even without proper training, and may also like it. Others like it a lot and do not ask questions as long as it pays, and injuries are treated. Some remain criminal, others escalate and become reavers for the Demon Lord. The Demon Lord rely on powerful servants and slaves to grow in power and exert its will upon the world. Some has joined the Demon Lord’s service voluntarily, while others are slaves. The Abyssal Dragon. One of the greatest and oldest dragons is a known servant of the Demon Lord, and will lay kingdoms waste should it awaken. This dragon makes you question where dragons actually come from. It is a creature from hell who has grown so old and powerful that its origins are forgotten and perhaps irrelevant. The Dead God. A fallen god grasping at the hope of resurrection once fell under the Demon Lord’s shadow and is now completely lost to the darkness. The Dead God will rise again and spearhead the apocalypse as a willing force of the destruction for the Demon Lord. The Betrayer. A great hero of the past fell to shadow and became a thing of malice and vengeance, betraying all it once stood for. The Betrayer will rise from the grave as the End Times comes, don the now darkened armor, and lead the Abyssal Host as it launches its onslaught on the world. The Dread Emperor. The once ruler of great empire still lingers, invested with the power of the Demon Lord, and yearn to return and reestablish the lost great realm. Delusional, confused and embittered by those who do not understand, this tyrant will again claim the mantle of rulership when the Old Empire rises from the bones of ages past. Demon lore has a plethora of powerful artifacts. Some are great weapons used by or against the Demon Lord, while others are foci of great spells that may alter the world for the worse. The best-known artifacts are the personal weapons of the Demon Lord, but also its servants carry items of great power. The items have roles to play in the Rise of the Demon Lord, even if only as plot devices for your story. The artifact’s function is unimportant as long as they sound ominous and promise great power to the possessor. d12 Item ..of (Descriptor) Who? Performing a ritual using the artifact will under the right conditions opens the Abyssal Gate. Using the artifact against a greater demon or other supernatural creatures will ensnare and imprison it inside the artifact. Reversing the attack will release all creatures trapped inside the artifact, possibly with horrific consequences. An army carrying the artifact is invincible on the battlefield. Performing a ritual with the artifact as foci will destroy an enemy outpost, level a city or eradicate an enemy bloodline. Nefarious tomes and blasphemous texts are at the heart of demons cults, promising power and wisdom. The demon cult always seeks the lost texts of the ancient sects and the secrets taught by the demons masters. Finding complete works is next to impossible. These texts can unlock vast power, and but are hunted by the God of Light and other meddling powers of the multiverse, making the texts challenging to assemble and use. The rewards of doing so are thus all the more significant. The dungeon areas and monster theme are essential building blocks of any dungeon, including the Dungeons of the Demon Cult. You can proceed to the more exciting stuff once you have the basics covered; the evil, the vaults, and the dark secrets of the dungeon. Dungeon Areas. The dungeons related to the Demon Lord – the cult temples, the abyssal host barracks, the lieutenant stronghold, and Demon Lord’s Lair – all require the nuts and bolts of other dungeons. An entrance area, barracks, storages, vaults, the list goes on. See my previous post on the topic of dungeons. Dungeon Monsters. The Dungeons of the Demon Lord is inhabited by a mix of generic monsters and the monster theme you have developed for your demon cult. You can stock the dungeon quickly if you have a strong monster theme, freeing time to focus on the Demon Lord’s lieutenants. The lieutenants of the Demon Lord, both mortals and supernatural, have strongholds deep underground or in the faraway corners of the world. The Death Titan. The oldest necromancers in the multiverse still linger in the shadows, and one now serves the Demon Lord. The master of the dungeon is an aspect or simulacrum of the titan, or perhaps the titan itself. Fallen Angel. Even angels may falter and have a crisis of faith. Perhaps it was captured and tortured, or forced to make impossible choices, and eventually succumbed to the regret, pain, and corruption of the Demon Lord. For some only accepting its fate offer some release, and so it was for this angel. Ghoul King. This gluttonous lord was obsessed with food and bodies and rose to power through conquest and betrayal. Never satisfied he eventually heard the whispers of the Demon Lord and accepted a bargain to reach new heights of degrading pleasure, and became an eater of the dead. Lamia. The mistress of the demon cult dungeon is a lamia, a half-woman half-beast monster, with vast magic powers and influence into human society. The lamia demand wealth and human sacrifices, and in return weave powerful spells to empower the cultists. The lamia is growing in power as the Demon Lord’s shadows deepen, and she will rule the realm as a terrible queen as the End Times draws near. Lich King. An archmage of the Old Empire sought to cheat death and claim the throne in civil war and a wave of assassinations. The Lich King was defeated, some say by the hand of intrepid heroes, while others argue the would-be tyrant fell because of its own paranoia and increasing insanity. The Lich King turned to the Demon Lord in the end, and the lord accepted. Mummy Hierophant. This once powerful oracle and guardian of the dead grew envious of mortal power, sought to overtake the realm and become its ruler. The Demon Lord appeared at the end, and the high priest of the dead fell to darkness taking the bargain. Shoggoth. The dark corners of the world hide creatures beyond comprehension and the Demon Lord has gone to great lengths to control some of them. A shoggoth slumber in the dark below the dungeon, to be called forth as the End Times approaches. Killing the shoggoth may be a monumental task, but perhaps the Demon Lord’s control can be disrupted? The Undead Knight. The troubled knight, once a hero of the realm, stir in the darkness of the demon cult dungeon, craving redemption for past sins and vengeance on those who turned their backs to the knight’s struggles. Only the Demon Lord, wearing a friendly face, understood and continues to promise release. The Dead King. A restless dead king awaits in the dark of the dungeon, burning with lust for further conquest and vengeance, fueled by the darkness of the Demon Lord. Worm-that-Walks. This abomination is corruption and decomposition taken. The remains of one of the Demon Lord’s servants have rotted away until only a mass of worms remains host to a dead dark soul. Crusaders’ Crypt. The area is a forgotten crypt of a group of crusaders who fell to the Demon Lord’s corruption. The chambers hide secret lore, lost artifacts and scripts, and powerful weapons, in addition to the crypts themselves. The cult treasures these secrets, believing they will aid them to power and protect them when the End Times comes. Dark Scriptorium. This area is the lost library of heretic clerics and scholars and was once home to mad philosophers. The library includes fragments of the Book of the Demons and may hide the secrets of the Great Rituals that binds the world together. Elder One Chamber. An evil creature of the past slumbers in the deep below the dungeon. This creature may be a fallen god, a demigod wizard of the ancient Demon Empire, an imprisoned Great Old One, or a Fallen Archangel. Regardless, unlocking this chamber has been a riddle for centuries, and the cult dearly wants to learn its secrets and open the stone door at the right moment. The Demon Cult’s Vault. This area is the dark heart of the demon cult, just a step down from the Demon Lord’s lair in the Abyss. The vaults hide both holy and unholy weapons, relics, dark texts, crypts of the restless dead, and vast wealth. These chambers are guarded by everything the cult can summon – horrid undead, bound greater demons and powerful warding spells. Cultist Preparations. Cultists are preparing a Grand Ritual. Heretics. Heretic templars and clerics arrive from the city. Manifesting Corruption. The shadows deepen and the air cool as the Demon Lord glimpse into the mortal realm. Food spoils, maggots and insects crawl from nowhere, and dark magic increases in potency. Undead and demons may appear. Unnatural Weather. The apocalypse draws nearer, manifesting in unnatural weather. Visions of the Past and Future. The characters experience visions of both the past and the future, some of it is so vivid that it may harm or kill the character. The Ghost Girl. Ghosts appear, dead long passed, from your past. A little girl is singing. A Rise of the Demon Lord Campaign may play out in many ways. A reasonably well-paced campaign would be three or four adventures in the first act, five or six adventures in the second act, and a final act of one or two adventures. A big decision is figuring out when the Demon Lord steps through the gate, or if the demon already is here. The demon cults worked tirelessly for ages to create the gate so the dark master can come to the mortal world, and heart of this campaign is that gate. The opening of the Abyssal Gate is an earthshaking moment and should be used to either kick off the story at the beginning of one of the acts or as a climax of the entire story. The first act establishes the characters in a series of short adventures introducing the setting and the demon cult as the protagonist. The Shadows from the Sea. News from a remote whaling settlement speaks of men from the sea stealing children and hunting the religious. This affront to light and humanity cannot continue, if true. The Orc Prophet. Rangers report that orcs are gaining strength in the wilds, now led by a dark shaman claiming to serve an rising dark god. Echo of the Past. Secretive archaeologists are unearthing ruins in the wilderness and recover unholy artifacts believed lost, and the oracles of the God of Light sees glimpses of a terrible future related to these findings. The Dead Priests. A shadow has fallen on the cathedral, and priests are missing. The missing priests are later found dead with self-inflicted wounds. The Serial Killer. A killer with unusual power and skill stalk the dark alleys of the city, and the city watch is in way over its head. The Return of the Betrayer. The Betrayer, the prophesied general of the Demon Host, has risen from the dead and is gathering forces in the wilds. Incriminating Documents. Investigators come across incriminating documents tying the city rulers to a sinister cult in an underground vault. The Girl in the Woods. A ghost girl beckons travelers deeper into the woods, leading them to a half-buried ruin. The Murder in Gilded Halls. Rumor has it a noble’s party got out of hand, and a girl was killed. The city guard is feigning an investigation, but the guard is corrupt and is hiding the evidence and protecting the wealthy killer. The Archeologist’s Journal. A recovered journal in the current adventure point towards a lost temple for a deeper plot. The Succubus’ Bargain. A succubus needs a package delivered to a holy church, laying a trap for both the church and the characters. The bargain may be alluring and offer power, but a succubus does not share voluntarily, and always seek to get the better deal in the end. The first act ends with the realization that the End Times draws near, the cult’s public front is apparent to the characters. The darkness grows in the second act as the Final War is upon the world. The Natural World Shudder. The planar barriers are breached, and natural disasters occur in higher frequency. Perhaps summoning elemental titans, powerful fey and angels will halt the spreading darkness and stabilize the world? The Civil War. The lands are in upheaval following the rumors of the return of the Demon Empire. Cultists have influence in circles of power, and some cities turn to evil in an attempt to save themselves. Unrest leads to rebellion and civil war as the darkness spreads. The Silence of the Gods. The contact with the gods dim and divine influence grow fainters. Divine spells lose potency, and even skilled acolytes struggle to learn the simplest spells. The world seems to be cloaked by a shadow, and dispelling this darkness requires tracking down its source and destroying the foci of this great spell. The Dead God Rises. A dead cult stir and the worship of a near-forgotten dead god appear again on the fringes of society. The heirs of this god, until recently perceived as dominant and secure, are in upheaval over this change in the balance in the pantheon. The Dead God wants to settle old wrongs and reclaim its rightful place in the cosmology, while the Demon Lord watches behind the scenes. The Armies of Darkness Assemble. The mortal armies of darkness gather, either in the form of a bestial horde in the wilds or by a proxy army in lands fallen to the dakness. Desperate attacks on the host’s commanders and their strongholds may stem the tide of evil. The second act ends as the Demon Lord’s presences is apparent and the Final War is upon the world. The End Times is at hand, and the demonic forces are about to consume the world. So what happens when the End Times is here? You continue fighting. The Demon Lord appears, or at the least draw nearer. The characters must rally whatever mortal forces that remain ensure the gate is shut, slay the Demon Lord, and turn back the tide of evil. The third act is the climax of the campaing, and will change the setting forever, or perhaps end it should the characters fail in their tasks. The Gate to Heaven. Some may seek to rouse the Gods of Light, if they even exist, and open a gate to summon the host of heaven to counter the darkness. The Demon Lord expect this, and this is where it will strike hardest. The War Against the Abyssal Host. The Demon Lord’s army marches and war is upon the world. The mortal realms must muster their armies as best as they can to counter the attack, save what they can and at best stall for time as heroes prepare a strike into the heart of darkness. Against the Dread Emperor. The mortal armies face the returned Demon Empire and its Dread Emperor, who is a threat even without the presence of the Demon Lord. Against the Demon Lord. Slaying, or at least banishing, the Demon Lord is the most significant test of any hero. Injuring and banishing the Demon Lord may safeguard the world for the present, and perhaps millennia. Slaying is likely to be much harder but will end the threat forever, or at least until some new darkness rises. But that is a tale for another day. Closing the Abyssal Gate. Ending the invasion means closing the Abyssal Gate, and monumental task on its own right. How long the Gate will remain closed depends on the fate of the Demon Lord and its chief lieutenants. The campaign ends when the world ends, or the Demon Lord is defeated, and the gate closes. Dungeons of the Demon Cult. Cheat sheet brainstorming and running demon cult dungeons. The Wikipedia page for Dungeons and Dragons Demon Lords is a first stop to get an idea of the published lore on Demon Lords. The following included affiliate links. The various publishers have produced many Demon Lord themed books for fantasy roleplaying games over the years. The Temple of Elemental Evil (1985) involves, despite its name, a battle between two demonic entities, and the natural sequel, the Queen of the Spiders (1986) deal with a third. The Shadow of the Demon Lord (2015) is both a game and a setting in one book by Robert J. Schwalb. Speaking of Schwalb, his of his earlier for D&D work, Exemplars of Evil (2007) and Elder Evils (2007) dwell on similar topics. Other D&D tomes from the same era includes the Book of Vile Darkness (2002), Hordes of the Abyss (2006) and Tyrants of the Nine Hells (2006). Demon Cults and Secret Societies (2017) by Jeff Lee and Jon Sawatsky are available both for Pathfinder RPG, and Dungeons and Dragons, from Kobold Press. 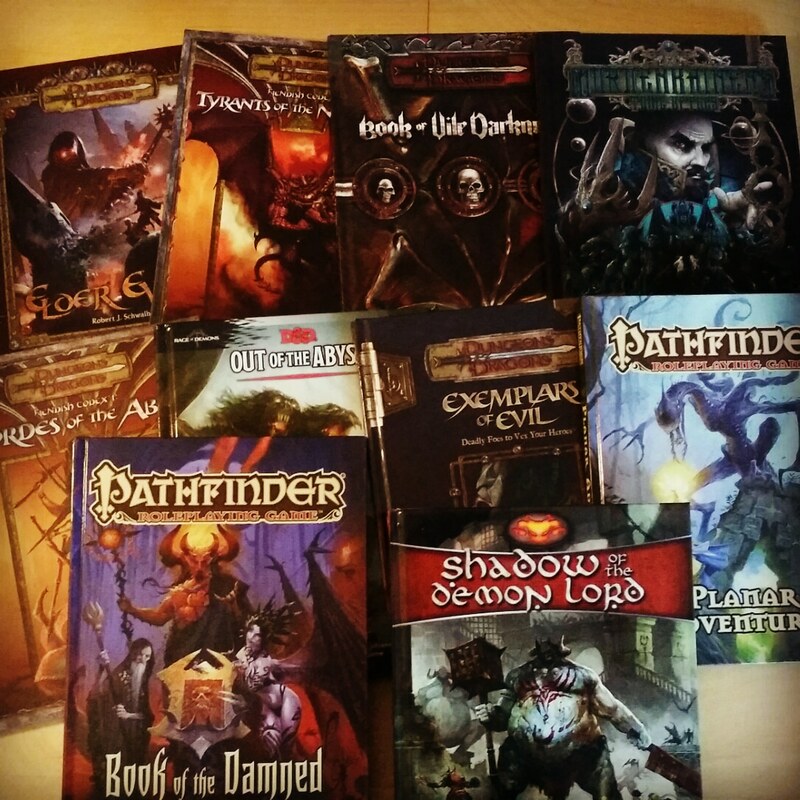 Paizo has several exciting books for Pathfinder Roleplaying Game covering topics related to demon lords, for example the Book of the Damned (2017) and the Planar Adventures (2018), both from the tail-end for the first edition. Both cover topics already covered in previous books, but now presumably updated and expanded for these hefty hardbacks, and together are building blocks for a planar game. Especially the Book of the Damned relates to our topic of demon lords, devoting a hundred pages to fiendish divinities. Does your story or adventure work with Black Sabbath soundtrack? You’re doing alright if the answer is “yes”.